With two finely appointed bedrooms, cosy living spaces and an array of child-friendly amenities, Villa Leelawadee is ideally set up for small families of four, although additional beds may be installed to accommodate up to six guests. A full range of modern amenities and impeccable service ensures that you’re not left wanting for anything during your holiday. 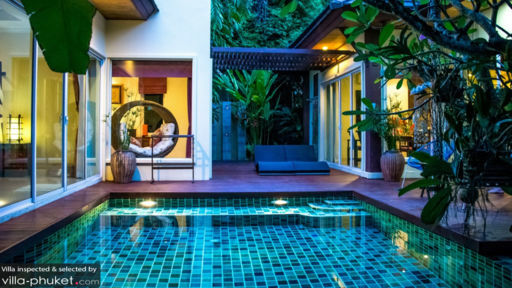 Both bedrooms at Villa Leelawadee enjoy bright, airy interiors and easy access to the pool. A careful collection of oriental ornaments add an Asian accent to the décor. The master bedroom features a four poster double bed framed by silky curtains along with a spacious en suite outfitted with a jacuzzi tub, while the guest bedroom is equipped with a double bed and en suite with shower recess. An extra bed may be installed in each room to accommodate additional guests. 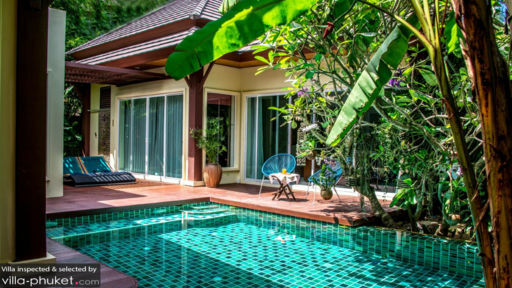 With a turquoise pool, spacious deck and well-maintained garden, guests will have everything they need for outdoor relaxation at Villa Leelawadee. The pool is made child-friendly with the addition of underwater benches, so young travellers may splash about safely in the waters. Outdoor lounge furnishings and sun recliners let guests lounge in comfort by the poolside and garden. 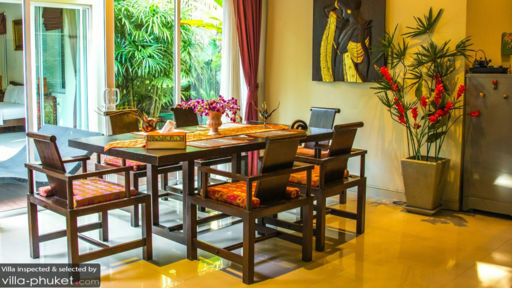 Kitted out with a full range of modern amenities and elegant furnishings, the interiors at Villa Leelawadee makes vacationers feel right at home the moment they step in. A sofa and armchairs wrap around a coffee table and flat screen TV in the lounge area. It extends out to to include a dining area furnished with a six seater dining set crafted out of dark-wood. With an array of restaurants easily within reach, there’s little chance you’ll be making full use of the cooking appliances in the well-equipped kitchen - though you’ll appreciate having a coffee maker and toaster for easy breakfast making. Villa Leelawadee enjoys twice weekly housekeeping services. 24/7 security service keeps the compound secure. Child-friendly amenities like pillows, blankets, comforters, a high chair and kids toys are available at request, and babysitting services are provided at additional cost. You’ll also find board games, snorkeling equipment, mini surf boards, a sewing kit and first aid kit in the storage room. Upon reservation, the owner will send out brochures. Packed full of information, these guides will equip you with essential tips so you can start your holiday well-informed. Leelawadee enjoys a prime location with numerous local amenities easily within reach. Dotted around the vicinity are banks, supermarkets, grocery shops, laundry shops and vehicle rental stores. There’s plentiful options for dining too; located a skip away are restaurants like EAT Bar & Grill, Old Siam Authentic Thai Restaurant, Karon Café and Bai Toey. The southern end of Karon Beach - a spot that offers great snorkeling - is about five minutes’ walk from your villa. For a lively ambience, head over to Kata Beach or Patong Beach. The former, located seven minutes’ drive from your villa is home to upscale dining and nightlife establishments. Patong Beach (14 minutes’ drive) isn’t lacking in the dining or nightlife scene, but its more raucous vibe may not be for every traveller. Away from the beach, there’s luxury spa treatments at Mövenpick Resort & Spa (five minutes’ drive), day trips and diving courses with Sunrise Divers (just footsteps away from your villa) and culinary lessons with Kata Thai Cooking (five minutes’ drive). Add cultural sightseeing into your itinerary with day trips to attractions like Wat Chalong Temple (20 minutes’ drive), Phuket Old Town (30 minutes’ drive) and the iconic Big Buddha (30 minutes’ drive).